The answer to this question takes a little creativity, planning, time, and teamwork. 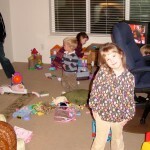 Our bonus space upstairs – our saving grace - was an eye sore to me for three years. I hated it. Because of its odd shape, I had a difficult time seeing its potential to be anything other than a giant toy box with a desk. I rearranged furniture on a regular basis, hoping to make peace with my zig-zag shaped room. Then, ding! A light went on in my head. Perusing through- or more like desperately inhaling one of my decorating books- I found a picture of a small home office with a window seat and built-in shelving. And there it was: the answer to all my bonus room woes. Duplicating this idea for our home would kill three birds with one stone: add seating, storage, and charm (and I’m all about charm). Once we had the plan, then everything else fell into place: the wall color, the accent colors, the home office. My creative juices started flowing, and I could finally “see” the potential for this room. We got rid of our over-sized computer desk and scaled down to a computer armoire - which I bought second-hand. We also enlisted the help of my in-laws. They are two of the most gifted do-it-yourself people I know. My father-in-law is a skilled craftsman (although he would deny this fact emphatically), and my mother-in-law is a seamstress extraordinaire. Together, they are a powerful team…and have been a huge blessing to us. We put our heads together, using the picture from my decorating book as a guide, and began planning out the window-seat wall unit. From the moment I came up with the idea for our bonus room to the finished product was two years. Sometimes these things take time, but they are well worth the wait. I love our window seat. It’s a great place to flop with a good book or catch up on a little e-mail. 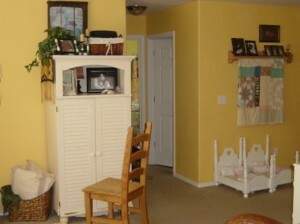 There is a place for random toys, shelves for books, nick-nacks and pictures, and ample seating for people. The transformation of this room has been an incredible gift to our family. Other individual spaces can be created with a little tweaking. In our living room we have a big red chair. It is my special spot. That’s where I have my quiet time in the morning, and where I like to flop in the evening (Joel loves this special spot too, so in the evening it’s first come/ first serve ). I have fluffy pillows that makes sitting there super comfy and warm. My patio in the summertime is another example. Our outdoor space has been a work-in-progress. This year I finally broke down and bought patio furniture. In the past it’s been “pay for a root canal…or buy patio furniture?” You can take a guess at which one we opted for. 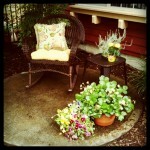 This year we were able to take the plunge and add a little patio seating to the exterior decor of our home. And I must say, I am loving it. The landing. You can create something sweet at the top of your stairs by adding a little shelf, a wall collage of pictures, trunk, plant, or small chair. Your bedroom. I talked about this in my post about the master suite. You can read about it here. A corner. Depending on the layout of your home, look for a corner that shows potential for becoming a special spot. 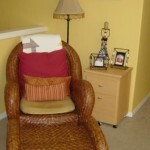 There is a great post written by Sarah over at A Beach Cottage that demonstrates this concept well. It could even be one side of your couch. 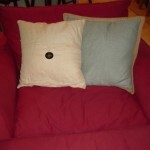 Add a couple of fluffy throw pillows, a soft blanket, and you’ve created your own special place. Next week we’ll face our junk square in the eye and show it who’s boss. Thanks for joining me…see you next week! So creative! My in-laws sound similar to yours… but they live 3,000 miles away. Anthony’s mom made the bunting and bed skirt for Christopher’s crib… I treasure it!